There are times when I seriously wonder about the thoughts of web designers. Today, I followed a link to the website "The imperfect parent". It included an interesting article on the Girl Scouts of America welcoming transgender children. The report was brief, simply saying that the Girl Scouts of Colorado welcomes any child that identifies as female into their organisation and I scanned through it to the bottom of the page. "Beaten, malnourished Oklahoma girl lives in closet - woman allegedly forced 5 year old to drink her own urine and eat feces." "Parents go to concert, leave baby in trunk." "California mother arrested for killing baby in microwave." They were also all marked as "Minor Topics". I stared at the headings for a moment and .... you know what? 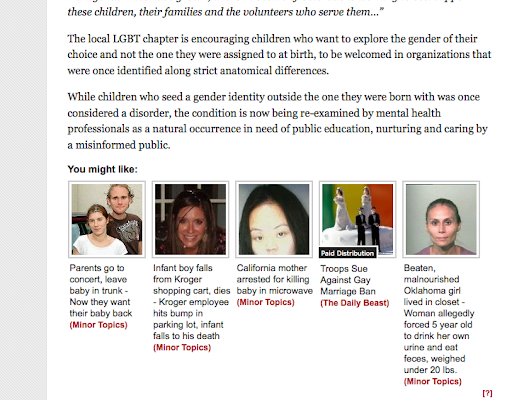 Despite the website's suggestion, I don't like ANY of these articles.